Have you ever had to visit a college campus with a teenager? The thought of breaking out an over-sized folding map and looking for directions to the science building or hockey rink can easily lead any self respecting teen to instant mortification and meltdown! Despite all of the digital options available these days, if you want a good pocket map of a college campus, your best bet for durability and “ease of use” is a Z-CARD ® pocket map. 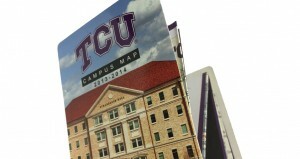 Why are these colleges and universities choosing Z-CARD ® for their pocket map needs? The mapping – Z-CARD ® pocket map is a fully folding poster joining between 24-48 small book pages or individual screen spaces into a complete map display. This makes the pocket map easy to use, open and fold. The covers – Z-CARD ® pocket maps are bound between two hard covers. This creates a small hardcover book that protects it and creates a sense of value to the owner – we are trained never to throw away a book. Fare media options – Fare card slots and sleeves help riders keep their fare media and their pocket maps together in one place. Clutter – Do visitors really want to download another app to their device and learn to use it for a visit? Many older consumers are not interested in this trend. A simple in-hand tool with a pocket map does the job.